My daughter is T-I-N-Y so it has been really hard to get back into the rhythm of cloth diapering her because no diapers I had fit her! I soon got sick of all the disposable diapers I was going through and all the waste I was creating so I set out to find a cloth diaper that would fit a small newborn like mine! 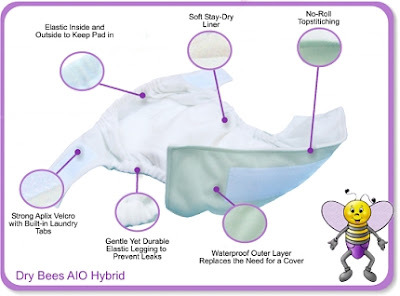 The DryBees All In One Hybrid Diapers are made from the same pattern as the traditional DryBees pocket style diapers, but these have their own three layer microfiber insert enclosed within the body of the diaper and leg casings for a sure fit. I love the microfiber material because it dries quickly but absorbs a lot! Also, I love that it is both an All-in-One diaper because the soaker is sewn in but also a pocket diaper because it has a pocket for an additional insert if needed...thus the Hybrid name! These unique qualities makes it the perfect solution for the heavier wetter, day trips or night time use. However, sadly this diaper was WAY too BIG on my 8 lb daughter. It says a small should fit a 6 lb and up but this diaper was really big on my daughter's legs and waist. You can see in the pictures above that the legs are really big and would leak if she would wear it right now. Also, the waist is too big as well because they do not have overlapping closures. As you can see above, it is quite a bit bigger than other diapers that fit her right now. Buy It: You can purchase the DryBees All in One/Hybrid Diaper for $16.95 on the Green Beanie Bottoms website. Win It: Green Beanie Bottoms is generously offering (1) DryBees Hybrid Diaper (in your choice of instock size/color) to a lucky winner!